Most of us have shared the experience of washing a favorite wool sweater, and having it shrink to half its size. Wool is such an incredible fiber and can be shrunk, or felted, on purpose for fun! Each strand of wool is covered with scales. When demonstrating felting techniques I like to make the comparison to pine cones. With the right type of friction, and sometimes water, the scales on wool will lock in place. And you cannot undo the process. Historical specimens of felt date back 3,500 years. Some cultures have used felt for ceremonial dress, blankets for trade and even yurts for housing. Perhaps the first piece of felt was created by a shepherd filling his animal hide footwear with wool for comfort, and noticing that it becomes solid piece of fabric with heat and moisture. Preschool children can enjoy making wool balls using the wet felting technique. Children can be encouraged by choosing wool colours and gently wrapping the wool roving into a ball shape. Then using their hands to sprinkle slightly soapy water over it, and gently rub the surface. Slowly, the ball begins to take shape. The more they work with the ball and soapy water, the firmer the ball becomes. Once these balls are dry, they will even bounce. Sometimes I put bells in the middle of these balls and make cat toys. Of course the wet felting technique is just a tool for the artist’s vision. Wet felting over a resist to make a hat, vase, or fairy box is simple and achievable by all. Another type of wet felting that has gained popularity is knitting an item and shrinking it on purpose. I have made oodles of woolen clogs this way, as well as tea cozies and market bags. The Complete Photo Guide to Felting is a wonderful resource for felting techniques. My personal favorite technique is needle felting. The supplies you will need are simple and include a square of foam or Styrofoam, several colours of wool (fleece or roving) and a felting needle. Due to the popularity of this technique, many fabric and craft stores now carry these supplies and you could also check with local artisans. Using the felting needle and an up and down stroke, wool becomes entangled without the use of soapy water. A beginner can create a wonderful picture in less than an hour. I keep pieces that I am working on at my kitchen table so that whenever I have a few minutes I can work on it. Wool comes in many natural colours, but it is fun to have a palette of colours to work with as well. Other natural fibers can also be needle felted with wool such as alpaca, dog or even cat fur. Yarn may also be needle felted onto a background. Embellishments can be made to items such as blankets or clothing. Artists have used this technique to make three dimensional items such as life-size dolls, theatrical masks, and miniature animals and fairies. There really are no boundaries other than your imagination. Some books that I would recommend are Little Felted Animals, Wool Pets and Fast, Fun and Easy Needle Felting. Recently I offered two needle felting workshops at the Middleton library. The participants were all extremely eager to learn this new art! Some of their work, pictured here, may inspire you too! Wool …. ahhhhhh. It truly is an incredible fiber. Ok, perhaps I am biased. I raise sheep because they grow fabulous wool and I spin, knit and felt with it. There is a lot of fiber in my diet! Sharing felting techniques with others has given me great pleasure throughout the years, and I learn something new each time I do. Enjoy exploring the resources that AVRL has in its collection on felting and experimenting with this wonderful art form. 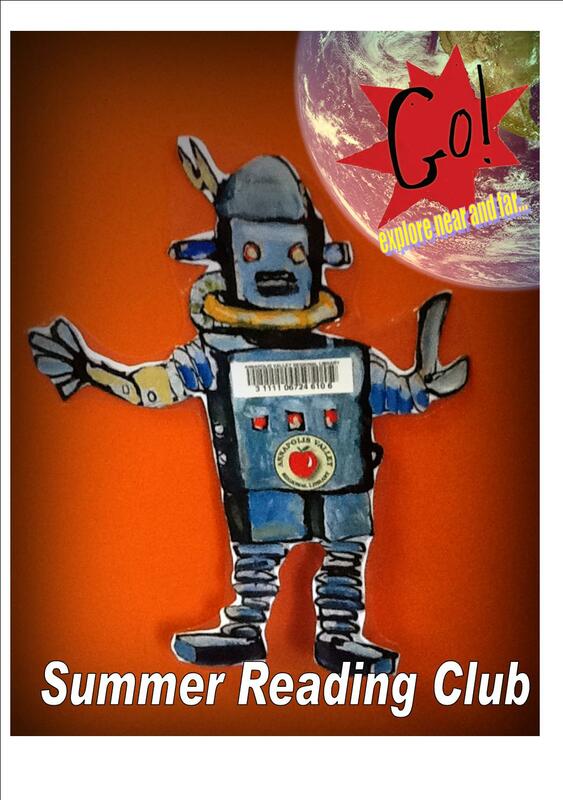 The library's annual Summer Reading Club begins on June 24 and runs through August 20. Once again we'll be offering a FastPass to Upper Clements Parks for all who finish their SRC reading goals. This summer, we have exciting programs from the Discovery Centre, Little Ray's Reptile Zoo, Mad Science, and a Harry Potter Party. Parents can get in on the fun this year with our "60 Things to Do in the Annapolis Valley" -- do at least 30 of the activities with your child and enter to win prizes. During the summer, many students experience what is called the "Summer Slide" -- all that knowledge they learned during the school year starts to slip from their minds as they are outside playing, swimming, taking hikes, and on vacation. 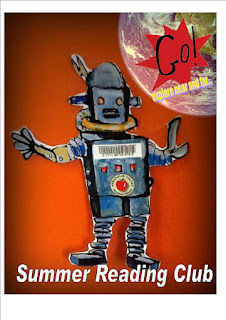 The Summer Reading Club is designed to be FUN, so that your children will actually want to pick up a book and read -- and keep those reading skills sharp during the summer months. Recent research has shown that kids who read during the summer have better reading skills when they return to school than those who do not read. Here at the library, we don't care what they read, as long as they are reading. Audiobooks count, too, so a long car trip can rack up some reading minutes; older siblings can read aloud to younger siblings; comic books count and so do magazines. Family read-alouds count for everyone! We've got lots of reading suggestions, so if you are stuck, just ask us. The TD Summer Reading website has booklists, too. Readers of all ages can get in on the fun this summer. There's a program for children up to age 12, including youngsters who are not yet reading, and a Teen Summer Reading Club for ages 12-18. Parents are invited to join in by picking up a "60 Things to Do in the Annapolis Valley" booklet. We've partnered with recreation departments in the counties of Annapolis and Kings, and the Municipality of West Hants to put together a list of free or inexpensive things to do right here in the Valley (though you are welcome to do them anywhere you like). Do at least 30 of the activities and enter to win great prizes, such as a two-night stay at Mersey River Chalets. Reading is its own reward, but we have some fun incentives for those who haven't discovered the sheer joy of reading. Prizes this summer include books, pencils, Oaklawn Farm Zoo passes, an iPad mini for teens, school supplies, and of course, a free FastPass from our partners at Upper Clements Parks. We look forward to seeing you at the library this summer! including over 500 communities across Canada. Throughout the month of June people come together to honour, remember and fundraise for cancer victims and survivors. The relay is an all ages, 12-hour event which is staged overnight. It includes an inspirational luminary ceremony resulting in thousands of candles lining the relay route. You can sponsor an individual participant or purchase luminaries with a $5 dollar donation . Camp Goodtime in Nova Scotia is an example of a project that is partially funded by Relay for Life. Camp Goodtime is a week-long summer camp for kids aged 7-15 living with cancer or a brain tumor. Activities such as canoeing, swimming, arts and crafts, outdoor education and sing-a-long sessions are part of the package. The Relay has a festival atmosphere and often includes returning participants. From all accounts the Relay for Life experience is unique and satisfying for everyone involved. Check here for information on how to support, participate in or attend an event in your area. Choosing a pattern and material was absolutely mind-boggling! This is where I begin promoting our quilting books, of which we have many. Sadly, my mother is no longer able to share her experience and expertise so I must rely on snippets of memory, touching and studying the quilts she gave me, while poring over a dozen or more library books. As a true beginner, with only the aforesaid background to guide me, I cannot stress enough how valuable it proved to look at as many books as possible. Even ones that seem too advanced -- or have quilt styles not suited to your tastes -- serve to guide you in some way toward choosing a pattern or passing on a tip or two. You definitely don’t want to spend your money buying any books until you know what's best for you. I found a book by Carol Doak to be a good starting tool. Not surprisingly, it's called Your First Quilt book (or it should be!). All your basic quilting lingo is described and explained simply. It talks about the tools of the trade – rotary cutters, rulers, and cutting mats; it lists common missteps and how to avoid them ; it guides you through each function, with diagrams. The Quilter's Ultimate Visual Guide, by Ellen Pahl is another one that proved very helpful. These two books, along with many others, gave me the knowledge and confidence to take the first step. I can't go without saying that this initiative proved a nostalgic, sometimes emotional, revisit to my childhood. It conjured up strong and very specific flashbacks of, as a toddler, being lulled to sleep by the whirr of a sewing machine; about age 4, my cat and I in our 'house' under the quilt, still in its frame taking up most of the dining area; around age 5, my cat and I fondling the patchwork pieces, counting and recounting the colourful finished squares; age 7, marking and cutting swatches of material from cardboard templates; at 10, sewing machine tutorials; and later, marking the patterns and actually quilting a few stitches with my mother and her needlework pals. (I was often delegated to "move the cat" in order that the flow of quilting could go uninterrupted). With a grandchild on the horizon, I'm realizing how those early days of being surrounded by the art of quilting were educational in so many ways. What a great opportunity to learn about colour, texture, math (count those squares for me, would you dear? ), fractions and angles, fine motor skills and development. 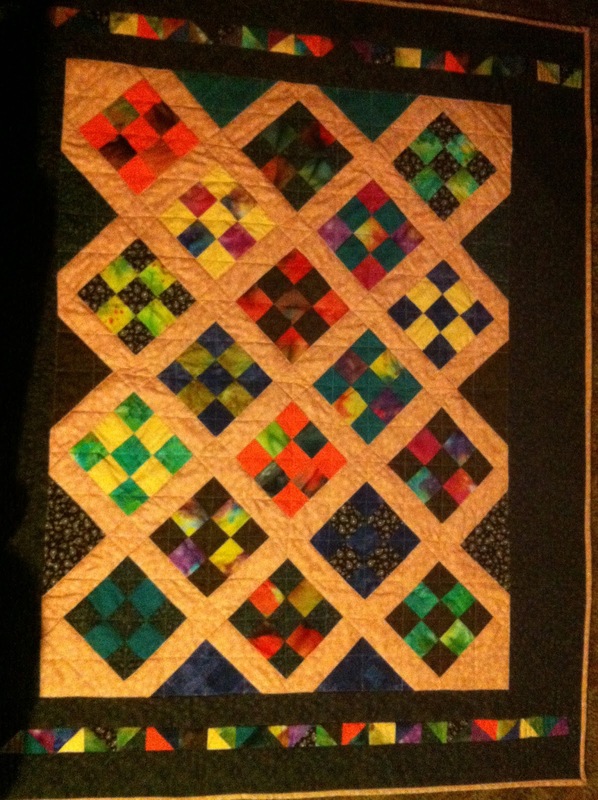 If you have children/grandchildren, definitely consider involving them in your quilting efforts! I know I wasn't always helpful, but I certainly absorbed many pieces of the experience. I have digressed. Our books will undoubtedly help you take the plunge into your first quilting project. Decide on a pattern, acquire your fabric, and make that first cut! Prepare to have housework undone. Inform your partner about the new Quilting Diet (few groceries in stock, and no meals prepared). And buy a couple of extra lint brushes. 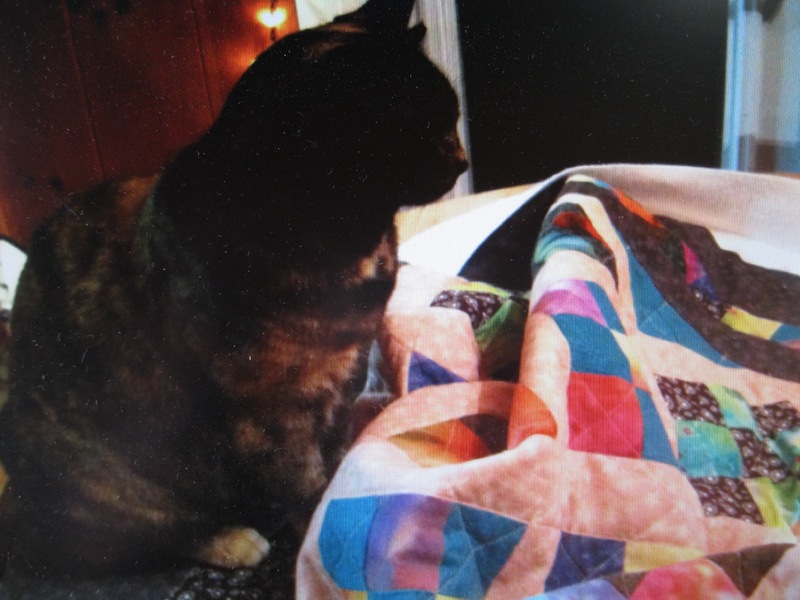 I thoroughly enjoyed making my first 'real' quilt , surrounded by many library books -- and, of course, my cat, who now comes running the instant she hears the whirr of the sewing machine! PS I used a sewing machine throughout my quilt project!